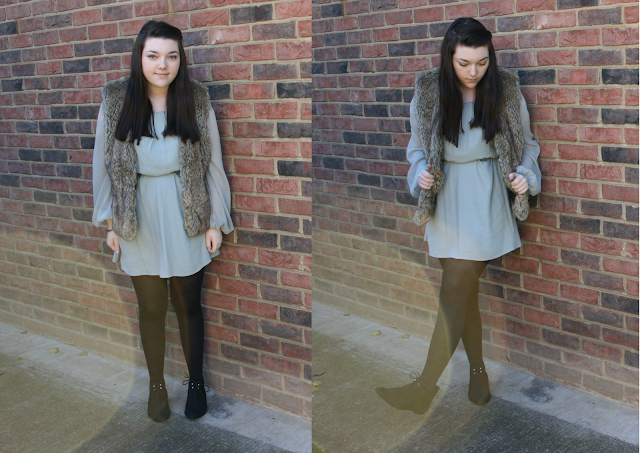 What I wore #006 // It's cold outside - Winter Outfit Of The Day | S J M W E L L - Fashion, Beauty & Lifestyle blog. This was the dress I wore for my 16th birthday party, I didn't even blog back then haha! I haven't worn it since (a whole year!) so I thought it was time for it to come outside the wardrobe. It's my nan's birthday so I wanted to look ~~presentable~~ but not dressed up to the nine's. So I attempted to make it more of a 'day' dress look, added my favourite belt at the moment so it didn't look weird. Yep it's those boot's i've worn all week, I love them. Picked this gilet up last year in a charity shop as it was turning warm, had a feeling it would come in handy for 2011, and oh boy I'm glad I did- It only cost me a few pound's, compared to the prices in some high street shop's at the moment, it's a bargain! Oh, Sam, you look gorgeous! That dress is gorgeous hun!! I love your bird ring! It's so dainty and cute? Just found your blog through the Monday Beauties Blog Hop & I’m now following. I'd absolutely love for you to visit my blog sometime! Please leave a comment if you do.